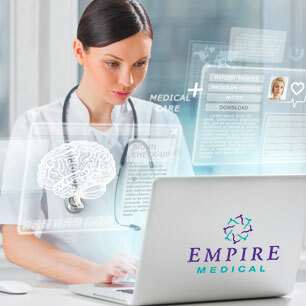 Empire Medical provides on-site Electromyograms (EMG’s) – a test that measures the electrical activity in muscle tissue and determines how well the nerves are functioning. The EMG should take between 30 and 60 minutes. If you are having a complete nerve conduction study, the person administering the test will perform the conduction velocity portion first. This involves placing several flat metal disks on the muscles being tested and the nerves that control them. Several quick pulses are administered to the nerve, which will cause tingling and some muscle contractions. This allows us to measure the speed in which impulses reach the nerves. The EMG itself is performed by attaching needle electrodes to the muscles being tested. Once the needle is in place, the clinician will ask you to contract and relax the muscles so the electrical activity can be recorded. Sometimes measurements are heard through a speaker, but most times they are observed on a screen as a series of waves and spiked lines. What does an EMG measure? How do you prepare for your EMG? Why would your practitioner order an EMG? Since needle electrodes are used in this test you will feel a quick sharp pain when they are attached. You may feel a tingling in your muscles for up to two hours after the test, as well as some lingering soreness where the electrodes were attached. Your practitioner may give you some mild pain reliever if you experience discomfort.